In the conversation around Australia’s space agency, the brand leaders – the US National Aeronautics and Space Administration (NASA) and the European Space Agency (ESA) – have had relatively little airplay. Yet Australia is a critical host to both, and neither would be able to operate its fleet of deep space missions without ground-based support from Australian soil: Tidbinbilla (near Canberra) for NASA, and New Norcia (north of Perth) for ESA. The launch of Australia’s space agency on July 1, 2018, provides the perfect opportunity for Australia to partner with ESA and NASA. We’re vital for the success of global space operations, and we can and should leverage this to Australia’s advantage. The Earth rotates, and Australia occupies a strategic geographic niche in the centre of the sparsely populated Indo-Pacific-Antarctic region. At any one time, Australia has domain over one third of the sky, and projecting outwards, one-third of space and one-third of the Universe. Ground-station support at Australian longitudes and latitudes is required for any remote mission, space station or colony wanting continuous communications. Given our strategic importance, and NASA and ESA‘s collective investments in space assets, supported by A$1 billion in Australian-based ground-stations, it’s surprising that they have featured minimally in discussions thus far. The reason may stem from misconceptions that Australia cannot economically compete with NASA and/or ESA, or that deep space missions aren’t really relevant to Australia’s economy. There’s also the feeling that working with other nations in space may compromise Australia’s sovereignty. I think these fears are misplaced, and we can easily address them to create advantages for Australia. 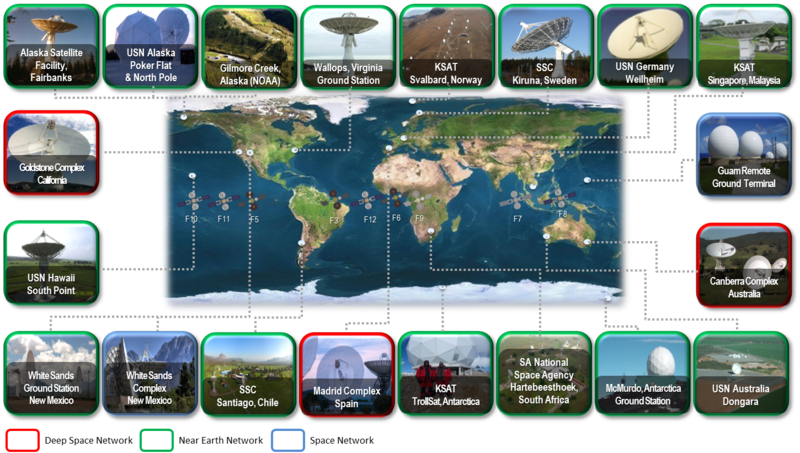 Almost every major space mission developed over the past few years by NASA and ESA has been collaborative, with multiple countries and agencies contributing components and subsystems. Most famously, the Canadian Space Agency built the NASA shuttle’s robotic arm. UK and European companies have also provided instruments, sensors, and components to many NASA missions. This mode of operation, based on collaboration not competition, is familiar to academia but less so to industry. It allows affordable engagement in massive projects, with the benefits that such engagement entails. While it is true that Australia could never expect to build its own billion-dollar facility, there is every expectation that Australian industries can develop critical subsystems and become an active, collaborative participant in humanity’s expansion into space. Almost every deep space mission is in essence a technology demonstrator, leading to multiple and diverse returns. ESA now operates 12 business incubation centres across Europe, geared at redistributing the intellectual property generated within ESA into the market via small-to-medium startups. Through this model ESA has helped to establish more than 500 new European companies, developing products from health to manufacturing and sport to agriculture. Both NASA and ESA routinely claim a 5:1 return on investment – these claims are difficult to verify, but are echoed in OECD reports. A partnership with ESA in particular could lead to the establishment of an ESA-sponsored business incubation centre in Australia, and similarly engagement with NASA spin-offs. There’s no getting away from the fact that space is tied to defence, with Australia already spending around A$1 billion per year on space-related defence activities. With space being famously just an hour’s drive away, monitoring our skies and what drifts overhead is important. However, with this comes a culture that fosters a sovereign “inward” outlook that is not necessarily conducive to open international collaboration. Can both a defence and an engaging mindset flourish within the same environment? This last point highlights one of the key issues confronting the new space agency: it has multiple conflicting roles. It needs to stimulate grassroots industry in a globally competitive, fast-moving commercial environment; it needs to connect collaboratively with brand leaders like NASA and ESA; and it needs to help secure the overhead border and participate in international legislation and governance that protects the national interest. An inevitable solution may be to accept that these functions are disparate, and best served by multiple nodes, distributed as best befits the capabilities that each state or territory has to offer. This week, WA Minister for Science Dave Kelly launched a bid to host the Australian Space Agency, along with a report on that state’s space capability. Perth is one of the only places on the planet where both NASA and ESA are actively engaged. For example, NASA works with the the Intelligence and Autonomous division of Perth-based Australian oil and gas company Woodside. Mining and space operators are looking to robotics in their routine activites. WA also hosts the NASA Solar System Exploration Research Virtual Institute at Curtin University. ESA operates one of its three deep-space tracking stations and its primary launch tracking facility at New Norcia, WA. ESA has made it clear that it hopes to significantly expand its operations at New Norcia through the construction of a second 35-metre dish. During these discussions ESA has highlighted a desire to shift its relationship with Australia from a fairly minimal engagement model to a more formal partnership, starting with the opportunity to co-build the new antenna (a A$60 million investment into WA). This collaborative engagement would be a clear win-win. For ESA – as it looks to expand its space-fleet and establish colonies on the Moon – it secures and cements its ground-operations into a nationally binding codependence, aligning ESA and Australia’s interests to ensure smooth operations into the indefinite future. On the Australian side, it opens the door to the creation of an Australian mission and operations control capacity, building on our strength in radio astronomy, and where we can start to realise the collaborative and commercial potential of our unique longitudinal monopoly. More shrewdly, any investment remains onshore, developing Australian-based infrastructure and creating real jobs and growth on the ground in rural WA. In an ironic twist, the first customer wanting to use the new dish may be NASA, who, hitting capacity at Tidbinbilla, has reached out to Australia and ESA to support their next flagship mission (WFIRST). WFIRST is a deep wide-field near-infrared survey telescope, that will advance our understanding of dark energy, dark matter, and the search for habitable planets. It also has tremendous science synergy with the Square Kilometer Array, combing these data will massively amplify the science return from each alone. It’s my belief that Australia should aim to create an off-the-bat tri-agency agreement between the newly formed Australian space agency, NASA, and ESA. Currently around 3000 people are employed in NASA or ESA in ground-operations in the US or Europe. In due course – as the children born today populate not just the world but also potential colonies on the Moon, Mars and beyond – the international global community will be best served through comprehensive ground-station networks in North America, Europe, and Australasia leading to a comparable employment opportunity for Australians in Australia. Australia, it would seem, has an important role to play. We have an opportunity to move from service provision to active partnership, and at the same time lean a little on the established leaders adept at industry engagement to kick-start our own aspirations and business start-ups. Engaging with NASA and ESA in a meaningful way has much to offer.